International toy designer Emilio Garcia held a four-day workshop with students in Drexel’s product design program that culminated April 16 with the completion of the students’ miniature toys. 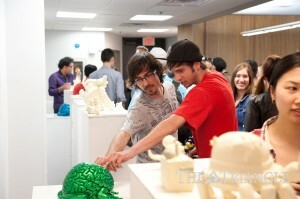 Garcia, who is best known for his jumping brain desk toys, worked with the Antoinette Westphal College of Media Arts and Design’s Product Design Program Director Michael Glaser to help the 29 product design majors and minors who participated in the exercise invent, design and sculpt with their own character toy. The students were divided into seven teams that had to come up with a toy after picking two words out of a hat that were meant to inspire childhood memories. “I wanted to put some particular people together so they could build on each other’s strengths or learn from each other. If everyone on one team came from New Jersey, then it wouldn’t be the same as if they had a person from China, a person from New Jersey, and whatever,” Glaser said. After a theme was created, the students also had to build a story around the fictional character. “What we really wanted to do was make stories, and when you call back on childhood memories or whatever, it invokes stories,” he said. “We had to be creative and think out of the box while combining materials and creating a structure that would stand on its own,” Kovacs wrote in an email. Other qualifications for the design were that the character couldn’t be larger than 4 cubic inches and had to be able to stand or sit on a flat surface. The final product also had to be able to fit on the scanner and be smooth enough so that the scan wouldn’t include any detectable flaws. At the initial project meeting April 3, students received their groups and inspiration and started the sketching process. The ideas were presented April 5 during a Skype meeting with Garcia, who wouldn’t be on campus until the April 13 meeting where he met with the students and reviewed their work and sketches. During that meeting, Garcia also presented his work and discussed what makes a good character for a toy. “I think it’s interesting when you bring a large group of people together. There are some very common shared memories and sort of common things, and then there’s always people who have their own individual and unique experiences and memories. And being able to sort of bring those together is always really rich,” Glaser said. 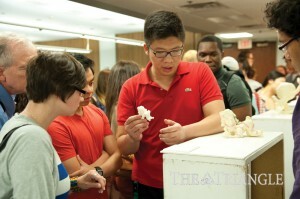 Garcia, Glaser and the students spent 10 and 11 hours respectively on April 14 and 15 to finish the designs, which were to be presented April 16 before Garcia held a public discussion and reflection on his work at 6:30 p.m. On Saturday, Garcia demonstrated how to do clay work and casting. Once the students had created their characters, he helped them begin modeling their designs in clay. The designs were scanned in Sunday and were grown to full size so they could be shown off Monday. “Team Boogers” named its character Gentle Judd and even came up with a backstory for him, which was written on a placard placed next to the toy at the presentation. “Emilio and I picked the list of characters, like the fireman and garbage man and cyborg and alien,” Glaser said. Glaser drew upon his own childhood when creating the prompts for the students. “I had a crazy uncle — he’s still a crazy uncle — and he’s a mathematician and made a thing for his kids, so when they wanted to log on to the computer they had to complete a math problem. If they got it wrong, he generated this really funny thing that would insult them. It’d be like, ‘slug drool’ or whatever, and so I was kind of pulling back on my childhood memories and wanted something that a kid would find funny or insulting,” he said. However, the inspiration Garcia used to create his famous jumping brain toy wasn’t as juvenile or premeditated. At his public discussion, which was held in the Stein Auditorium at Nesbitt Hall, Garcia revealed that he came up with the idea while thinking about the different ways people tried to jump over the Berlin Wall before it was torn down. “What makes him really unique and really this beautiful person is that he didn’t set out to be this designer toy guy. He really started out as an artist, and he’s very smart with Web pages and coding and all that stuff. He was inspired by going to Berlin and seeing the Berlin Wall, and then he sculpted this toy, not thinking it was a toy, and then put it up online,” Glaser said. According to Garcia, he put the image of the jumping brain on a special forum for designer toys and shortly after started receiving many comments about his toy. “I never expected that a week later that the little brain would be translated around the world,” he said. Glaser believes that Garcia’s jumping brain toy has had so much international success because it appeals to many cultures and can be universally understood and appreciated. “What makes his jumping brain so unique and popular is that I think it transcends and people can put their stories onto it. People can put themselves in his characters,” he said. When he emailed Garcia for permission to use the design, the artist readily agreed. “He was really nice, very open and very sharing. He was like, ‘Sure, go ahead, here are my files, do whatever you want,’” Glaser said. When Glaser was abroad in Barcelona, he went to dinner with Garcia to thank him, and the idea of the workshop grew from there. “What’s really sort of cool about him is a lot of time with the designer toy market is that usually they just stay little designer toys, but he’s pushed it to sort of. Now they’re in art galleries, and he does them in artist materials like bronze and wood, big ones. And now he’s using high technology to make them different materials, so he kind of transcends all these boundaries, which I really like,” Glaser said. At the discussion, Garcia also agreed with the prominence of designer toys in the art world. “Many people think that toys will be going to museums in a few years because they are sculptures. Other people think they are just desk toys,” he said. For Glaser and the students in the program, the next step is to make more figures, because they gave all the little creations to Garcia as thank-you presents, and then showcase them in more prominent public spaces.